DECENT Network is a digital content distribution platform aimed to reshape the online publishing industry. As it is based on Blockchain Technology, it brings cost-effectiveness, transparency and ultimate security. The open-source DECENT protocol will allow anyone to create applications on top of it and enjoy the advantages of decentralization without having to spend time and resources on building a new blockchain. To demonstrate the functionalities and potential of DECENT Network, the first application called DECENT GO is currently being finalized! 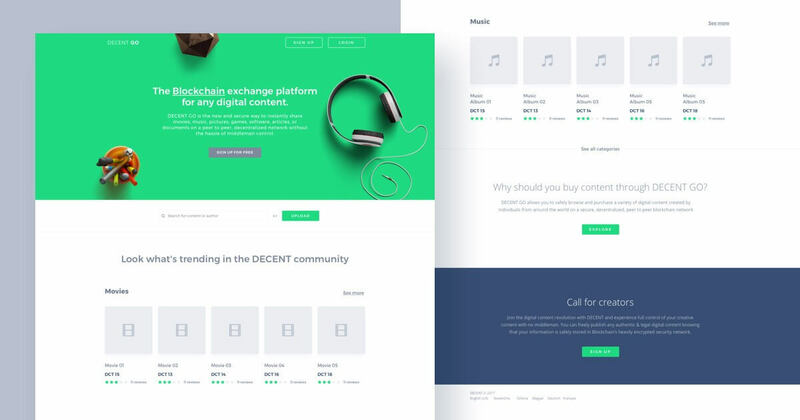 DECENT GO is a Google Play-like Digital Marketplace built on top of the DECENT Blockchain Network which allows content publishing and buying on a peer-to-peer principle. It includes all the features of DECENT presented during the testing phase. All users are able to create an account wallet, search for content and authors, browse content by category, read content descriptions and user comments, purchase content and leave a rating and a review on the content. Authors (content creators) have the ability to upload their own content, assign it to a category, write a description of the content, choose its lifetime duration, and allocate its price. The entire DECENT team is proud to present the following preview of the web-based DECENT GO application and its main features! The users will be able to easily create an account, explore the abilities of decentralized online publishing and build a life-time reputation saved in the immutable records of transactions – the Blockchain. DECENT GO will also include the online DCT Wallet. This Wallet will display the user’s DCT balance and allow him/her to transfer a certain amount to another account. We would like to say thank you to all of our supporters and ICO participants who made DECENT a reality. We are working hard to make the upcoming launch of DECENT Network successful. More updates are coming soon, remember to subscribe to our Newsletter and check the Slack and Telegram discussion channels!